October is one of my favorite months of the year! It has great weather, plenty of outdoor festivals, plus it’s Dyslexia Awareness month. October is also a time when a few “seasonal” treats can be purchased. I would like to introduce you to one of my FAVORITE and most used teaching tools. My students LOVE it and I could sense envy coming from many adults on Parents’ Night when I showed them how I use this versatile gadget. One dad even commented on how he would really like to have one in his office! ….it’s my handy dandy Mush Pot! 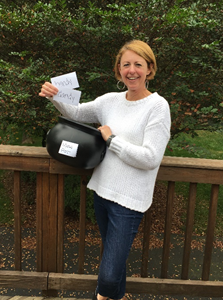 In this month’s blog, I wanted to share ideas about how to use this wonderful plastic cauldron so that you have time to grab one at the Halloween store before they run out (or better yet, grab one on the day after Halloween for half price)! While teaching Language classes, I use LOTS of index cards. We write hundreds of words on hundreds of cards. Those cards can easily be thrown in this light weight container, mixed up, and children can comfortably reach in to pull out words. 1. Teach a concept like CVC words with /ă/ (cap, rat, tab…). The next day, teach a similar but slightly different concept such as CVC words with ŏ (cot, hop, jog…). 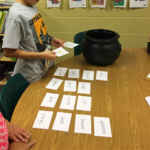 Then throw both decks of words into a mush pot, stir them up and let students pick cards out and sort to tents. One student could read the card aloud while the other student could echo, tap and spell the word on the table. 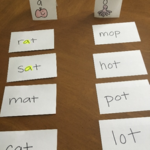 Students can read each word card, highlight the final consonants and sort into groups (-ff, -ll, -ss, -zz). They can throw cards into the mush pot that don’t follow the rules. Students are more apt to stay engaged if they have a few “unexpected” cards to make them think a little more critically. Sometimes I even let them tear up the aberrant card and throw it in the mush pot – kids go crazy over that! Have your students explain why the word did not follow the pattern – it really helps students develop a stronger understanding of the concept if they are asked to articulate the reason that the word does not fit the spelling pattern. 3. 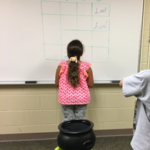 I often use the mush pot to review previously taught concepts. I will arrange a mixed group of “old” words on the table from our Review and Reinforcement deck. (I will grab two words from each of the previous concepts that we have covered.) 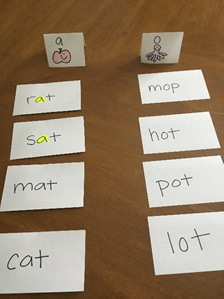 Then, I will ask students to pick up two cards that have a language concept in common, such as soft c or g, an r-controlled syllable, two closed syllables…anything that we have studied. For example, a student may pick the words lazier and ponies because both words require applying the change-y rule. 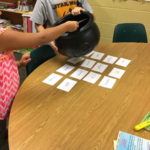 When they pick up the cards and explain how the words are related, students can throw the cards in the Mush Post. We repeat the process taking turns until there are no cards left on the table. Basically they are “making a match” and throwing the match in the mush pot. 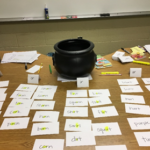 Once students have read through the cards and taken notice of similarities and differences between many of the words, they are ready for the spelling portion of the game. 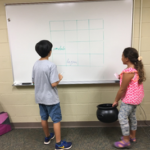 I then take the Mush Post to the board and have one student pull out a card and read it aloud, while the other student is asked to echo, tap and spell the word on the board, trying to write it beside another word that has something in common. I ask my students to explain their thinking to encourage them to articulate and demonstrate an understanding of the language patterns.